From pre-configured hi-hat/crash/ride cymbal packs designed to help beginner drummers get on the ladder, to hand-crafted, complex-sounding individual metals using the finest alloys, there has never been a better choice of cymbal companies, cymbals types and sounds available. As always, the more cash you spend, the more you will be able to unlock quality craftsmanship, premium materials and more pleasing cymbal sounds. However, a small budget doesn’t need to mean terrible sounding cymbals and cymbal companies are getting much better at extracting decent tones out of ‘inferior’ alloys. Each cymbal will have a slightly different tonal characteristic to the next one, so we would always recommend trying before you buy. And if you’re replacing individual cymbals within your set-up, you should always aim to complement your overall sound with any new additions, rather than choosing a model that sticks out unnaturally. We’ve tested a huge range of cymbals to suit all musical situations so, whether you’re looking for the best cymbals for rock, funk, metal, jazz, or any other style, we have you covered. In fact, your next cymbal is almost definitely on this list. Newcomers to drumming can be caught unawares when they budget for their first kit, not realising that drum manufacturers don't make cymbals and that the cheap brass cymbals thrown in with their starter kit are hideous duffers. Cheap cymbals just sound nasty. The SBR range covers the popular sizes a beginner is most likely to need. The medium weight and classic profile, along with the Sabian logo, give the cymbals authenticity. And they look the part with their deep, large-peen hammering and pinpoint lathing. This is the same hand-guided, high-pressure hammering and hand lathing that Sabian lavishes on its expensive bronze cymbals. Beneath their initial thin attack there is some real meat and tone. Brass cymbals will never sound as complex as proper bronze cymbals, but these are well worth upgrading to from the cymbals thrown in with your starter kit. Stagg cymbals from China have been with us since 2001, offering B20 bronze hand-hammered cymbals at shockingly attractive prices. The Single Hammered SH line-up is the cheapest in the range. Cymbals have uniform shallow hand-lathing top and bottom and extremely light hammering, almost unnoticeable. What the lack of extensive hammering does mean is they are a little short on projection when compared with more heavily-worked cymbals, but overall they have universally clean tones. The only thing stopping them being top class cymbals is a slight foreshortening of sustain and shallowness of timbre which the extra working of expensive cymbals bestows. It's most noticeable by the time you get to the larger 16" and 18" crashes, but at these prices it's unfair to be too sniffy. The SH may be Stagg's cheapest series, but for such budget cymbals they are unusually refined in tone. B20 bronze, hand-hammered cymbals at knock-down prices. Dream produce professional quality cymbals in the ancient Chinese cymbal-making region around Wuhan city. Dream's Contact series lies somewhere between the slightly darker, trashier Bliss series and the rockier Energy series. The Contact series is, unusually, made from B23: 23 percent tin content and 77 percent copper. With such a high tin content the result is a lovely silvery-gold colouring and a slightly brighter stick response. The cymbals have a satin ﬁnish with Chinese-style graphics, and surfaces are lightly dimpled with barely discernible hammering, close-lathed top and bottom. If you're into heavy metal, you should maybe look away now - these cymbals won't deliver a face melting. The vibe is softer and mellower: a hint of China trashiness, a spicy tang and bell-like clarity. They need coaxing, not slaying. But while they're not clangers, they can certainly be played hard. Each cymbal will sound slightly different, so you need to choose with care. Featuring splashes, crashes, chinas, hi-hats and rides, PST8s contain a fair few attributes from higher-spec Paiste ranges - chief among these is the CuSn8 bronze that the cymbals are made from. CuSn8 is Paiste's own blend of B8 and is also known as 2002 bronze after the legendary Paiste range that it was formulated for. Most of the diameters of cymbal are available in two weights - Medium and Rock. As well as being heavier, the Rock models also have larger bells, a slightly flatter profile and have been on the end of a few more hammer blows. Crashes open with a clean, silky blast of B8 that slides across the mix. Three pairs of 14" hi-hats are available - Medium, Rock and Sound Edge, and ride cymbals come in 20" (Medium & Rock) and 22" (Rock only) sizes. The 20" Medium gives a bright stick sound that generates a sympathetic accompaniment of wash. In comparison the heavier 20" Rock has a toppier, more lively feel, while the 22" Rock ride has a deeper voice and bigger presence. The S Family is extensive, with 38 cymbals available individually or in two boxed sets - a Performer and a Rock Cymbal set. Medium spaced rippled lathing covers the top and bottom surfaces, and there is intensive, graded machine hammering everywhere except on the bells. The collection encompasses four weights: Thin, Medium-Thin, Medium and Rock. A highlight of the range, stick definition on the 20" Medium ride is exemplary, with the clarity of a top pro cymbal, quite woody and focused. The 18" hole-strewn Trash crash has a funky thin and trashy element, like a super-thin fast crash. It would make a great effects cymbals, regardless of budget. Improving on Zildjian’s old ZHT series, the B12 bronze alloy S Family is a good-looking intermediate level series with a range of weights offering a compelling range of sounds. 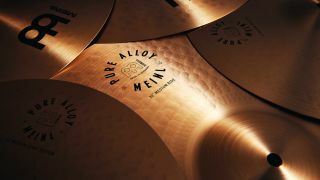 Meinl describes its Pure Alloy series as having “shimmering clarity”, and that’s pretty accurate. The top sides of each cymbal are finely lathed and then smoothed over with a tasteful shiny finish, plus small hex-circular computerised machine hammering all over except for the bells. Underneath, the lathing is also fine but not smoothed. Meinl is well known for its edgy, raw finishes and this Pure Alloy range is much more classic looking. Hi-hats sizzle nicely when just fractionally opened, powerful enough and yet controlled. The 15" pair have a little more character than the 14”s by virtue of being fatter and more assertive. Rides boast a zingy, attacking brightness and are ideal for playing alongside electrified bands. It’s when you get to the crashes that the Pure Alloy sound fares best, with a rich, translucent and rounded whoosh. Boasting a clean sound, Pure Alloy is an apt description for the series. Italy is famous for many things. However, you may not know the country has long been associated with cymbal production. UFIP (Unione Fabbricanti Italiani Piatti), is a Tuscan-based company, originally set up as a cooperative of four Italian manufacturers. Due to their fundamentally bright tonal characteristics, the UFIP Bionic series is aimed primarily at rock and metal players. The majority of the models are subjected to some rigorous hand-polishing, awarding them a glassy, gleaming finish. The high standard of manufacture is truly impressive. Crashes are big and powerful, with cut in all the right places, but never brash or trashy - they would have no problem pushing through the barriers of any acoustic or amplified instrument. Elsewhere, the 18” China blooms to burst, filling the air with a raspy, gong-like sound that is loud and penetrating. Overall, this is a fantastic set of cymbals which will be equally at home in a rock or metal environment and many other genres too. Effects cymbals are big business these days as cymbal companies strive to broaden the palette of acoustic players in the face of digital jiggery-pokery and e-kit popularity. Zildjian’s FX cymbal range offers a huge range of cool, quirky and mostly affordable sounds to drummers looking to enhance their sonic palette. Amongst the range, Oriental China Trashes are versatile little things, offering at least three distinct sounds - a tanking rounded short 'doink' of a bell, a clean central stick-tip 'ting', and a sharp trashy edge crash. Hissy Spiral Stackers offer a cool sonic as well as visual effect and the Zil-Bel delivers a soft and pure ping. Elsewhere, the dazzling Trashformer offers an airy splash sound, ideal for quick accents. The bottom line is that Zildjian has an FX model to match the sounds in your head. The only difficulty is in choosing which one to try first. For half a century Meinl epitomised the European style of so-called sheet bronze B8 cymbals. In order to penetrate the American market, Meinl took a crucial step in 2000 and opened a factory in Turkey, home of the traditional cymbal. And in 2001 Meinl launched its B20 bell-bronze alloy Byzance range. Following the time-honoured Turkish hand-hammering, Byzance cymbals are transported back to Meinl's German HQ for finishing. The Byzance range is vast, offering a wild range of styles, sizes and unique looks, and encompasses six sub-series: Jazz, Traditional, Dark, Brilliant, Extra Dry and Vintage. Byzance offers different shades of darkness – the Dark Series is left raw and produces a sound just as its moniker suggests, whilst Extra Drys straddle the line between traditional and modern perfectly. Despite their gleaming finish, even Brilliant Series cymbals dish out warmth and depth. In 2014, Cindy Blackman returned to touring with her old pal Lenny Kravitz. For that gig she felt the need for sharper, brighter cymbals, though not at the expense of losing her darker jazzy side. Hence the arrival of the Mantra cymbals. The small set encompasses a 22" ride, 20" crash and 15" hi-hats. The 22" Mantra ride has a brilliant leading edge with a sharp stick response. It cleverly combines its jazz and funk roots with a modern, more sparklingly loud and cutting thrust. The 20" crash also has a lower warmth and range, but starts with a sharper and livelier slicing edge. It's pretty fast for a 20", opens up easily and blooms luxuriously with a full rich whoosh. The 15” hats are plenty quick enough, but have a bit of extra heft. There's a softer and darker feel to them and they have a subtly subdued and husky tone. These cymbals retain that hallmark, traditional Istanbul character, but with a sharper, brighter cutting, rocking edge. Back in 1993 Sabian’s lathing and hammering technology helped usher in a cutting-edge, modern cymbal line with AAX. The key pillars of the line are brightness, cut and musicality with a wide dynamic range, making it the ideal range for modern pop, rock and R&B styles. AAX X-Plosion hats and crashes have become staples of rock set-ups from clubs to stadiums and the Raw Bell Dry ride is the stuff of legend. But the AAX range has so much more to offer. Newer models like the hole-peppered Air splashes, Aero crashes and Freq crashes, deliver the same brightness, but add extra sonic colour to an already winning cymbal line. Innovative models like the multi-tonal Omni, designed in collaboration with Jojo Mayer, are the icing on the cake. As far as classic cymbals go, Paiste's 2002 line is up there with the best of them. First introduced in 1971, the typically powerful, ballsy 2002 tone has been much admired by rock players in particular ever since. Today the series is an extensive one; alongside the 'standard' options are some interesting instruments, particularly in the ride and crash departments. Within the range you’ll find 18” to 24” rides, 16” to 22” crashes and 13” to 17” hi-hats in a range of weights, plus a selection of Chinas and splashes. There's not one cymbal amongst the range that doesn't impress when judged on its own terms. If you're not keen on any of the line it'll be because it doesn't suit your mood, rather than a case of being badly conceived. The 2002 series makes as much sense now as it did nearly 35 years ago. Drummers looking for darker, richer tones with contemporary voicing should look no further than Zildjian’s celebrated K Custom range. Cymbals within the vast K Custom universe are treated to traditional K hammering, in addition to modern hammering techniques that lead to unique and often complex tonal characteristics. Zildjian recommends K Customs for modern jazz, studio, country and medium rock, but with the increasing diversity in music, you’ll find K Customs being played by drummers everywhere from hip-hop to heavy metal. Scratch beneath the surface of the standard hats, crashes and rides and you quickly realise there there is a K Custom model to suit every situation – the surprisingly versatile Special Dry range caters to more modern tastes, while the dual-finish K Custom Hybrids, designed in collaboration with Akira Jimbo, offer unrivalled versatility. When Sabian was founded in 1981 by Robert Zildjian, the Hand Hammered or 'HH' series was its pioneering line. Thirty-five years on, these famously refined cymbals have been treated to a well deserved make-over. Sabian promises that with even more hammering - between 2,000 and 4,000 hammer strikes per cymbal - the HH series will now deliver even more complexity and more tone for the discerning drummer. Considering how long the range has existed, and as with most Sabian lines, there is a dazzling array of choice. We love the vintage styling and sound of the HH Remastered cymbals, and the jazz-friendly HH Vanguards, but within the range you’ll find everything from rapid-fire O-zone crashes and vintage hats, to big, dirty ride cymbals. Paiste’s Masters series was first introduced in 2011 and initially consisted of 12 rides that were, in the words of the company, “laboriously hand-manufactured to achieve superior sound ideal in various musical genres”. Since 2014 the premium line has slowly expanded to include five hi-hat pairs, eight crashes, comprising Dark and Extra Thin models, two splashes and a 22” Swish made to the specifications of session legend and Paiste endorsee Jim Keltner. Only Paiste’s most experienced cymbalsmiths get to work on Masters models and it shows in the top drawer sound. Ideal for recording and live work, Paiste Masters are particularly suited to jazz, blues, pop and country styles. With a wide range of cymbal thicknesses, delivering sound from dark to bright and dry to full of sustain, you should find the sound you’re after. These are big, beautiful and sophisticated cymbals capable of nuance and expression, best suited for players (particularly those studio-bound) who seek such attributes. Armand Zildjian, then president of the Avedis Zildjian Company, introduced the K Zildjian Constantinople series back in 1998. The aim was to recreate the look, feel and ultimately the sound of the original Turkish-made Kerope Zildjian Ks. After the death of Armand in 2002, the baton was handed over to R&D director Paul Francis and his team, who continue to develop the range, creating new models and series enhancements. The series' apparent suitability for jazz is echoed by the collaborative design input from several top jazz drummers including Adam Nussbaum with the 22" Renaissance ride, Kenny Washington 20" Bounce (and its larger 22" Bounce) and Elvin Jones with the 14" hi-hat. K Constantinoples are crafted in small batches via a meticulous 14-step process. The complex hammering approach in particular, stamps each cymbal with its unique sonic identity, both cutting and dark in tone. In 2004, Sabian introduced the Vault tag, a collection of special, individual cymbals from the Canadian company’s experimental lab where its master cymbalsmiths try out new ideas. Fast forward to 2017 and Vault as a series name was dropped, but Artisan is still going strong with these new additions under the banner of Elite and Light. The 22" Elite ride has a wonderful extra-dark stick sound. Played in the middle of the bow you’d almost think it was 24" or 26" rather than 22", it is so broadly sonorous. The 16" Elite hats are commanding, they feel big but don’t get in the way sonically. Although deep they are expressive and as they’re quite light there’s little feeling of hard work, of a lumbering lag in opening and closing. Both 14" and 15" Light team a lightweight, crashy top cymbal with a medium weight bottom and thus make a lighter-weight pairing, delivering a lower volume and duskier tone.